Here we go with another fad... Sigh, Vancity... I guess I shouldn't be so hard on my hometown since fads do occur worldwide. Somehow, it just gets a bit crazy here with one thing after another. The latest to go nuclear locally has been Korean Bingsoo (shaved ice). Ever since Snowy Village introduced the masses to Bingsoo (and their version of Taiyaki), there have been copycats (of course and why not) opening up. The latest is Passion8 Dessert Cafe on Cambie serving up their amped up versions. 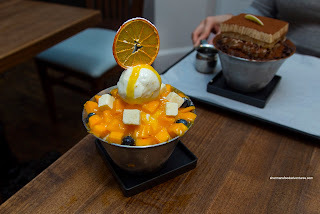 To get a baseline for comparison, Emily and I got a large Mango Bongo featuring shaved ice, cheesecake bites, mango, mango sauce and yogurt gelato. For me, it didn't take much time for me to crown Snowy Village the champion of this comparison. The ice itself wasn't too bad as it was airy and snow-like. It wasn't too sweet which was good since the mango sauce and ripe mango provided enough sweetness on their own. We weren't huge fans of the cheesecake bites as they were overly tart and powdery. The yogurt gelato was okay and did taste like yogurt. The real star of the show was the Tiramisu Shaved Ice not only because it was stunningly beautiful, the tiramisu on top was actually quite good. With a liberal amount of cocoa powder on top, there was plenty of chocolate goodness to go around including the firm chocolate shavings. The ingredients were sweet, but not too much which meant it was easy to eat. To kick things up, the side of espresso did what it was supposed to do. The only thing I didn't like were the bits of cheesecake again, they really didn't go flavourwise with the rest of the dessert. On another visit, Viv and I got the Strawberry Shaved Ice and it was essentially the same as the Mango except with a different fruit. Comparing to Snowy Village once again, I noticed that the snow was not as creamy. It was similar in texture and consistency though. Being that strawberries can be tangy, this ate a bit lighter than the mango. One big difference was that instead of cheesecake bites, there was a small slice of cheesecake on top. Although I enjoy dense NY-style cheesecake, I believe that a lighter version would work better for shaved ice. To vary it up a bit, we also tried the Very Berry Soboro Pancake. 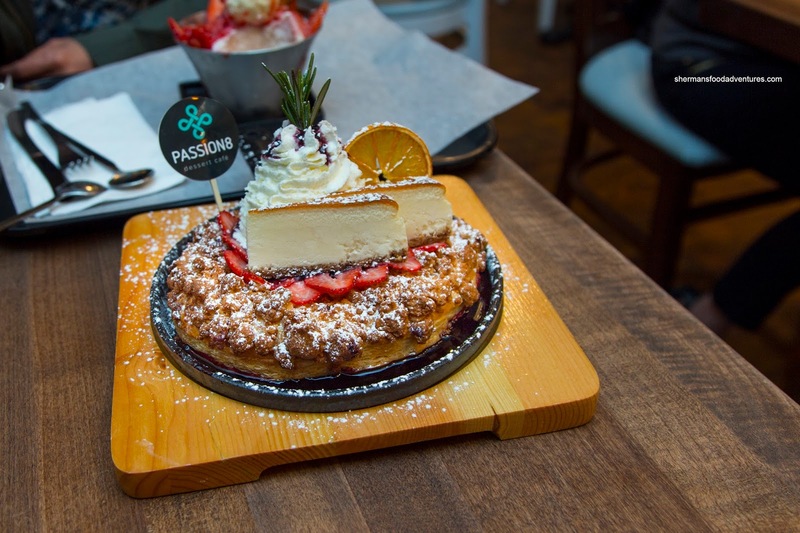 In reality, it was more like a flaky pastry pie with custard, sugar crumb topping, strawberries, whipped cream, cheesecake and blueberry sauce. Although it was quite the concoction, there was a bit too much going on. Individually, the components were quite good from the pastry to the not-too-sweet custard. Even the cheesecake was fine on its own. All together, it was muddled and confusing. 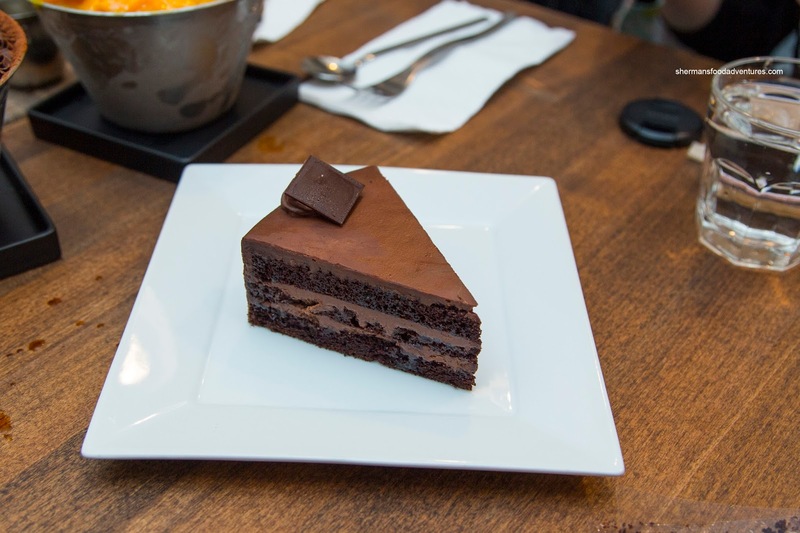 On a third visit, Grace wanted to try the Chocolate Gateau that featured thin layers of cake encased in a rich and chocolatey ganache. I thought the flavours were quite balanced with mild sweetness and of course a touch of bitterness. However, the cake itself was fairly dry. 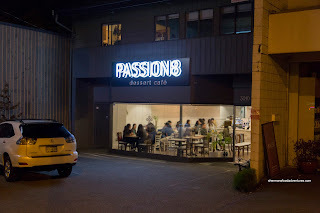 After 3 visits, Passion8 started to grow on me. 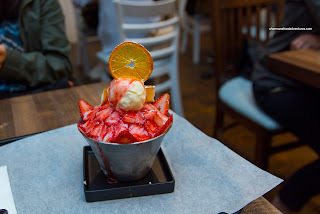 Although the shaved ice was not as creamy as the one at Snowy Village, it is still good and is definitely one of the better options in town. Went just recently about 3 weeks ago. 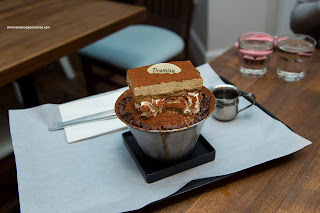 The Tiramusu Shaved Ice was awesome. But not sure I'd pay that price again.